Flutewise in Brentwood with Ian Clarke — Flutewise Live! 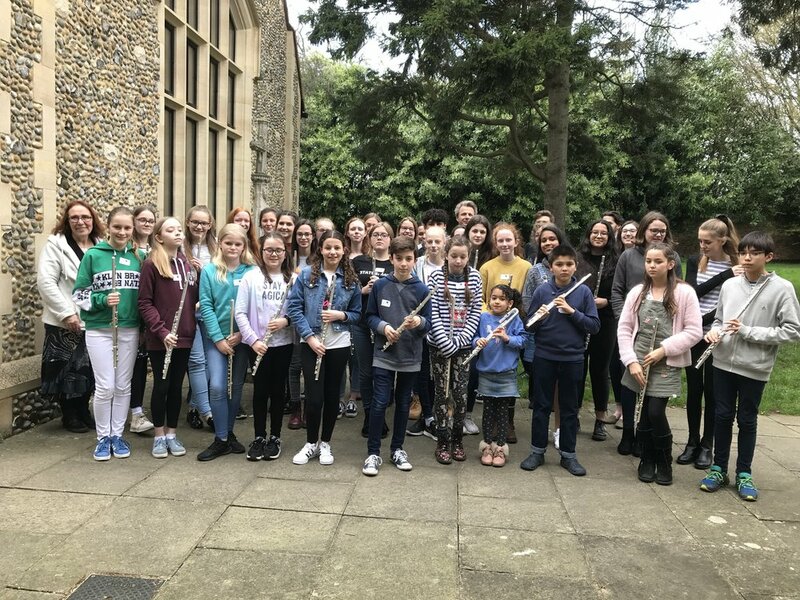 On Saturday 23 March we had a wonderful Flutewise day in Brentwood thanks to Carolyn Wheadon, an extremely experienced and talented flute teacher who has lots of students in the area. Ian was joined by Simon Williams who started the day off with his Grand Old Duke of York warm up. It was great fun. Ian took over and worked with everyone on various sounds in preparation for Walk Like This and Zig Zag Zoo which we learnt, rehearsed and played in the concert at the end of the day. Ian also worked on two of his pieces, Sunstreams and Hypnosis. Younger players arrived in the afternoon and while Ian worked with them, another local teacher, Sue Hughes gave a class on performance nerves to the older people. Tim from Just Flutes was with us with the travelling flute shop. After lots of playing we realised we had a short amount of time to fill so we all learnt Erich’s Game or piccolo. It’s a firm favourite. The church was packed for the end concert. Ian and Simon played Mia, Ian played Deep Blue and Great Train Race and then everyone played Zig Zag Zoo and Walk Like This. It was a lovely concert. If you click on this link you will find lost of photos.